Ex 8:20 And the LORD said unto Moses: 'Rise up early in the morning, and stand before Pharaoh; lo, he cometh forth to the water; and say unto him: Thus saith theLORD: Let My people go, that they may serve Me. Ex 8:21 Else, if thou wilt not let My people go, behold, I will send swarms of flies uponthee, and upon thy servants, and upon thy people, and into thy houses; and the houses of the Egyptians shall be full of swarms of flies, and also the ground whereon they are. Ex 8:22 And I will set apart in that day the land of Goshen, in which My people dwell,that no swarms of flies shall be there; to the end that thou mayest know that I am the LORD in the midst of the earth. Ex 8:23 And I will put a division between My people and thy people - by to-morrowshall this sign be. Ex 8:24 And the LORD did so; and there came grievous swarms of flies into the house of Pharaoh, and into his servants' houses; and in all the land of Egypt the land was ruined by reason of the swarms of flies. The swarms had to be so vast that they blotted out the sun, producing sheer horror at the sight and sound of them moving over the land. Flies laid eggs which hatched into maggots. 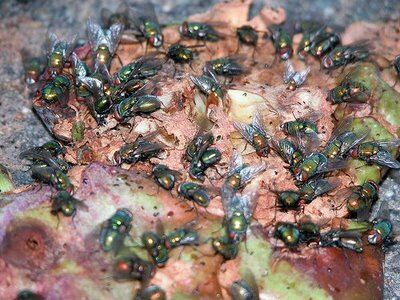 Flies and maggots were synonymous with death, rotting, and dung. They would have also been all over their food and in open wounds. By now the Egyptians had started to wonder why the gods, even khepri, the god of movement and regeneration, had allowed this. How can you have regeneration with signs of death all about?. The hieroglyphic symbol for Ra was an eye. Flies over an eye was a symbol of a dead decaying eye; a blind god. The Jewish people were cut off from the rest of Egypt. This showed the Egyptians that G-d was indeed the LORD G-D and Protector of the Children of Israel.